Baked Ziti with homemade mini meatballs, fresh basil, and three Italian cheeses coming out of the oven all hot and bubbly is Italian comfort food supreme! When you try my Baked Ziti with marinara sauce, fresh basil, and all the Italian cheeses you can stand, there’s no doubt you’ll agree that it’s the best Baked Ziti recipe ever! With its ricotta richness and meatballs filling your house with the aromas of fresh basil and parsley, it is a perennial favorite at our house. My base recipe was Baked Ziti Giada-style, which is a great recipe, but I use marinara sauce and added 1-½ cups of julienned fresh basil. Ziti pasta is totally tubular!! Sorry, 80’s flashback, but it does fit the definition in more ways than one. It’s tube-shaped and pretty rad. Ziti got its name from the word zita, which means bride in Italian In Naples, in particular, it is served at weddings as the bride’s pasta. Ziti is perfect for baked casserole dishes, and popular casserole dishes containing ziti and mixed cheeses are called pasta al forno, meaning oven-baked. There’s no shortage of delicious ways to make baked pasta casseroles. One of my other favorites is Baked Mostaccioli. This dish was a regular feature on the dinner table when I was growing up, and for good reason. It has rich layers of flavorful Italian sausage and is similar to lasagna, but much simpler to make. Everyone will think you spent all day in the kitchen! Another Italian baked casserole that I love is Five Cheese Ziti Al Forno. This might be the cheesiest dish ever. If you’re concerned about calories, this is not the dish to ask about. Just. Don’t. Ask. Revel in it with your family and friends, and then just put it behind you. I can’t engage in all this pasta talk without mentioning my Million Dollar Spaghetti. This is my go-to family pasta casserole recipe and is like lasagna and spaghetti combined. It calls for cottage cheese, but don’t let that turn you away. It gives this dish a wonderful creaminess. You can also make Meatless Baked Ziti. It’s still delicious. Also, it’s easy to make Baked Ziti Vegetarian by adding zucchini, yellow squash, and red bell peppers in place of the meat. Baked Ziti With Ricotta is the basic classic form of baked ziti, without the extra work of the meatballs. This dish can be prepped, assembled, and baked in no time flat. This Baked Ziti With Meat is also a more basic form of baked ziti. You only have to brown the meat before mixing it with the cheeses and pasta al dente, and baking. Baked Ziti With Chicken is a yummy favorite of mine. You cook a couple of chicken breasts in a skillet, cut them into bite-sized pieces, and mix them in with Italian cheeses and al dente pasta. Then, bake. Baked Ziti With Italian Sausage recipe is made with ground mild Italian sausage and is absolutely delicious. If ricotta isn’t your thing, you can forego this ingredient and make Baked Ziti Without Ricotta, using lots of mozzarella and parmesan instead. Sturdy Pasta – When baking with pasta, you always need to ensure that you are considering the thickness of the type of pasta you are using, and how long it should boil it before baking. This will prevent gooey pasta in your casseroles. Al Dente – To cook pasta al dente, when cooked and cooled it should have a very slight firmness to it. With ziti, since it is a sturdy pasta, you also want it to retain its shape and not crack. Frozen Cocktail Meatballs – If you want Baked Ziti but need a shortcut in the prep time, frozen cocktail meatballs will work just fine. How To Make Ahead – Baked Ziti is a perfect dish to make ahead of time. You can prepare it as if you were going to put it in the oven, cover with aluminum foil, and leave in the refrigerator for no more than 3 days before baking. 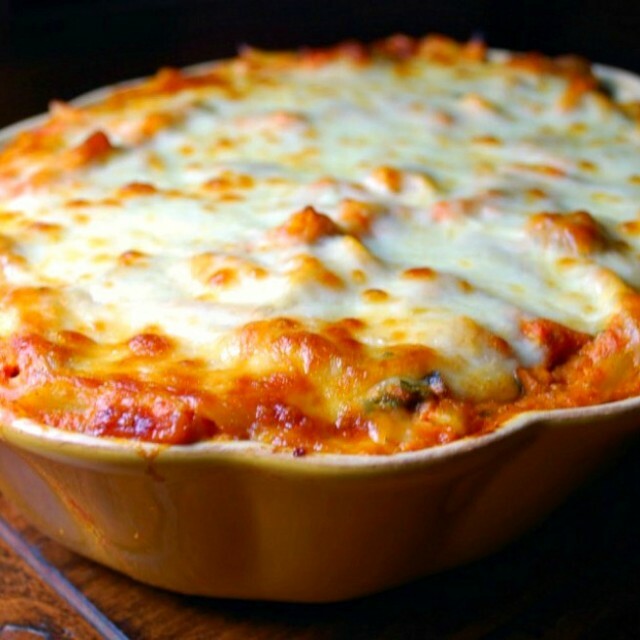 How To Freeze –You can also freeze Baked Ziti after cooking. Place into a freezer safe container and store in the freezer for up to 3 months. Serving Suggestions –One of the best things to serve with this Baked Ziti is some warm and crispy garlic bread, and a fresh green salad. In a large pot, bring 6 quarts of salted water to a boil. Add pasta and cook until al dente, about 8 minutes. Drain pasta in a colander and set aside. If not using immediately, cover the top with plastic wrap so that pasta does not dry out. Do not rinse pasta with water since you want to retain the pasta's natural starches so that the sauce will cling to the ziti. In a large skillet heat the olive oil over medium-high heat. When almost smoking, add meatballs in batches and without moving or turning the meat, allow it to brown for about 3 minutes. Turn meatballs and brown the other side. Continue to cook until all sides are golden brown. Remove meatballs to a plate. In a large bowl, combine the Marinara sauce and ricotta and mix well. Add the cooked ziti, fresh basil, and meatballs and toss gently. In a large greased baking dish (mine was 9 x 13 x 2 1/2inch), pour in pasta mixture. Sprinkle the mozzarella, Parmesan, and remaining Romano all over the top. Place baking dish on top of the baking sheet covered with aluminum foil to collect any drippings from the dish. Bake until top is golden brown and bubbly, about 30 to 40 minutes. Made this tonight and while it was good, it was not as good as I expected. The ricotta cheese to sauce ratio was way off. The texture was too grainy. Next time I will half the ricotta and double the mozzarella to improve the smoothness. I made the meatballs with a 1 Tablespoon cookie scoop and they were perfect!! Loved the flavor and texture of them!! Hi Julie. I’m surprised to hear you found the ratio off. I guess I agree with Giada on this one but I really appreciate your input on the recipe. It’s interesting how we all enjoy things a little different. Good to know the 1 tablespoon cookie scoop worked well. It’s a great idea to use that. i am not a fan a ricotta cheese, is there another cheese I can use? Picture shows penne not ziti, but still sound awesome! I saw this recipe from your homepage slider… YUM! Anything with tomato sauce and baked cheese gets my attention immediately. I’ve never made ziti, but I love cooking Italian food and I can’t wait to try this recipe! What is your marinara recipe? Mind sharing? In your headnotes you mentioned that you used 11/2 cups of basil in this recipe, but you only have 1 cup of basil listed in the ingredient's list, what happened to the last 1/2 cup of basil. Look at that cheese goodness! It makes me want to dive in and eat it from the inside out. Excellent post. Your photos are gorgeous and I cannot wait to try this! I love love love pasta recipes with lots of cheese and sauce. Thanks so much for linking to Saturday Swap… please remember to include the button to link back to the party in your post. I love love baked ziti! I usually make mine with italian sausage- so good! That picture with all the cheese melted on top is gorgeous! Oooh, I love all that cheese on top, it looks delicious! I love a good Baked Ziti and this one sounds fabulous. I have all of Giada's books but may not have noticed this one. I will definitely try this very soon. Be still my heart! This looks delicious. Thanks so much for the recipe. Have a wonderful weekend filled with good food. 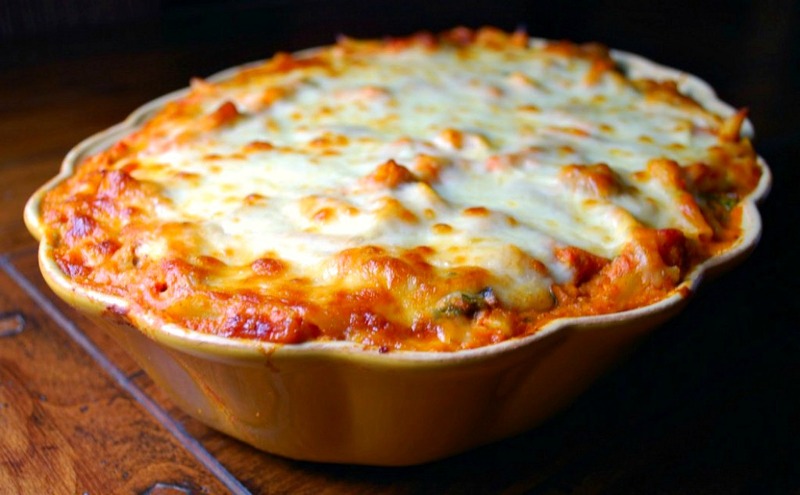 I'm totally into this for the weekend..
wow, your baked ziti looks absolutely delicious! What a beautiful looking dish that's also comforting and satisfying. 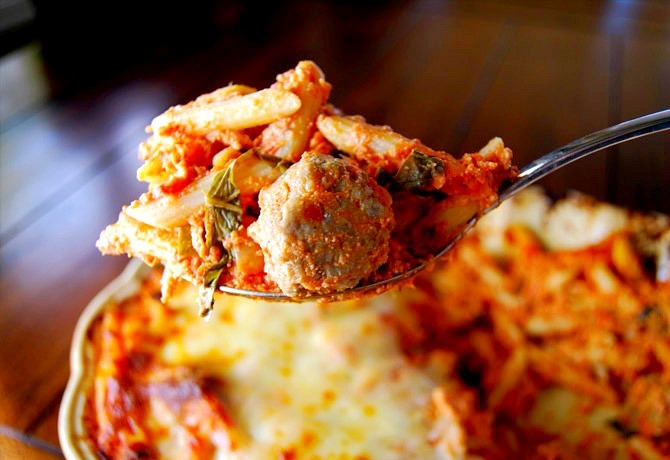 I must agree…I first tried baked ziti when I was 13, and I fell in love. I may have to make this tomorrow night! Thank you for sharing with me tonight. I hope you have a great Friday. I'm so ready for the weekend! That's a killer recipe, Kathleen. I love those mini meatballs. Cheese and more cheese is how I love my baked ziti! I think I'll make this with mini ziti to go along with the mini meatballs!!! Those meatballs are so cute and tiny! I love everything about this recipe! I'm totally won over by the mini meatballs. I know this would be a real family pleaser. Love baked ziti! Adding the mini meatballs is such a good idea 🙂 My husband would go crazy for this one for sure! Giada never disappoints me with her Italian dishes. This looks amazing! 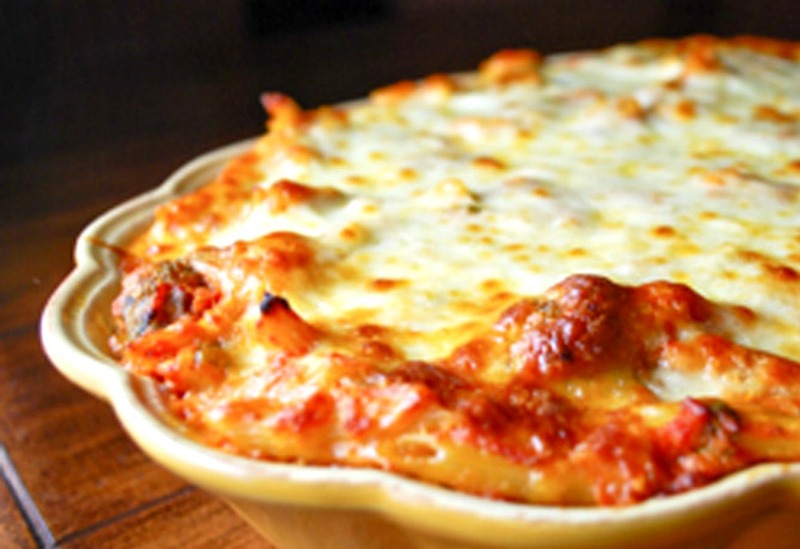 One of my boyfriends favorite dishes is baked ziti…I think he would love it with the meatballs too! Thanks for the idea! Baked ziti IS the best pasta dishes of all time. And you just elevated this dish here. This looks amazing. That looks great. I love baked ziti, mini meatballs would just bring it up a level. I would love this! I love a good baked ziti – but with meatballs? I'm sure it would be the only meal I would want to eat every day for the rest of my life. Delicious! Mmmmm looks delish! Mini meatballs! Too cute! Wow! That looks absolutely fantastic. 🙂 I love the idea of the mini meatballs. They're so cute. 🙂 And all that wonderful fresh basil must be splendid! Ziti! Now there's a pasta I haven't had recently. I need to add that in to a meal plan soon.